Brass knuckles and a pistol holster that were in Jack Ruby's possession at the time of his arrest after he murdered Lee Harvey Oswald were presented along with other historical documents and memorabilia connected to the assassination of President John F. Kennedy during a press conference in Dallas today. Long-hidden items and documents related to the 1963 assassination of President John F. Kennedy were revealed for the first time after spending nearly two decades locked inside a courthouse safe. Dallas County DA Craig Watkins presented the articles at a Presidents' Day news conference while standing next to brown and white file boxes stacked in a pyramid. 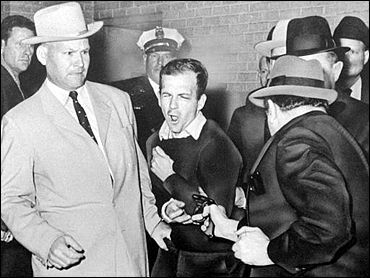 The items include a purported transcript between Kennedy assassin Lee Harvey Oswald and Oswald's killer, nightclub owner Jack Ruby; a leather gun holster that held the weapon Ruby used to shoot Oswald; brass knuckles found on Ruby when he was arrested; and a movie contract signed by then-Dallas District Attorney Henry Wade. Watkins said investigators told him about the contents of the blue, two-door safe shortly after he took office in 2007. 'And every DA up until the new administration decided that they wanted to keep it secret,' he said. But he decided 'this information was too important to keep secret.' One of the most intriguing items was the typed transcript of an alleged conversation between Oswald and Ruby. The transcript - which hasn't been examined by experts and has already been called farfetched by some - includes talk of killing the president at the behest of the Mafia.